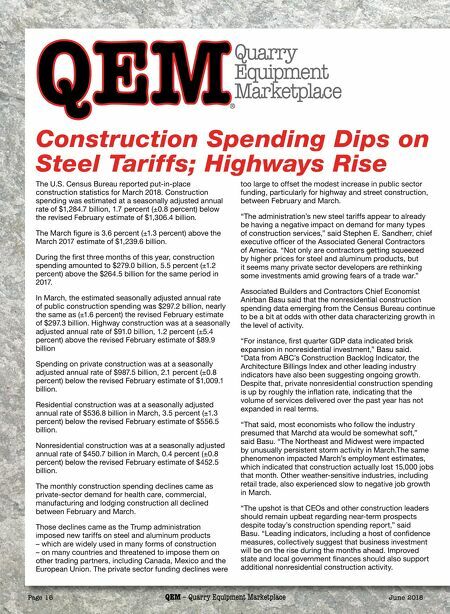 June 2018 QEM – Quarry Equipment Marketplace Page 17 Page 17 QEM – Quarry Equipment Marketplace June 2018 Regards, Mark Kuhar, Editor Rock Products Magazine Mining Media International "At the same time, construction industry leaders must remain wary of a sea of emerging risks to the ongoing economic and construction industry expansions," said Basu. "Interest rates are on the rise. Materials prices, including those associated with softwood lumber, steel and aluminum, are expanding briskly. Wage pressures continue to build. There are also issues related to America's expanding national debt, increasingly volatile financial markets, geopolitical uncertainty that has helped to propel fuel prices higher, and lack of transparency regarding America's infrastructure investment intentions. The challenge for construction CEOs and others, therefore, is to prepare for growing activity in the near-term, but for something potentially rather different two to three years from now." Dodge Momentum Index Moves Higher The Dodge Momentum Index jumped 6.1 percent in April to 163.0 (2000=100) from the revised March reading of 153.7. The Momentum Index is a monthly measure of the first (or initial) report for nonresidential building projects in planning, which have been shown to lead construction spending for nonresidential buildings by a full year. Both components of the Momentum Index moved higher in April, with the commercial component up 6.3 percent and the institutional component up 5.8 percent. Over the last two months the commercial portion of the Momentum Index has posted the most aggressive growth, fueled by continued low vacancy rates for commercial buildings as well as the potential benefits from the tax cuts passed in December. The gains for the institutional component, while healthy, have been more moderate reflecting the ebb and flow of public funding for larger education and public building projects. In April, 12 projects each with a value of $100 million or more entered planning. The two leading commercial projects were office buildings – a $200 million building in Boston and a $175 million building in Atlanta. The leading institutional projects were a $100 million hospital in San Luis Obispo, Calif., and a $100 million training center in Pelham, Ala. New Home Sales Rise 4 Percent Sales of newly built, single-family homes rose 4.0 percent in March to a seasonally adjusted annual rate of 694,000 units after an upwardly revised February report, according to newly released data by the U.S. Department of Housing and Urban Development and the U.S. Census Bureau. This the second highest reading since the Great Recession. 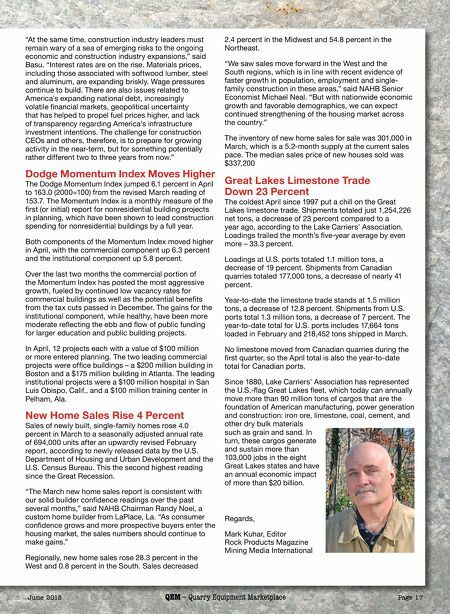 "The March new home sales report is consistent with our solid builder confidence readings over the past several months," said NAHB Chairman Randy Noel, a custom home builder from LaPlace, La. "As consumer confidence grows and more prospective buyers enter the housing market, the sales numbers should continue to make gains." Regionally, new home sales rose 28.3 percent in the West and 0.8 percent in the South. Sales decreased 2.4 percent in the Midwest and 54.8 percent in the Northeast. "We saw sales move forward in the West and the South regions, which is in line with recent evidence of faster growth in population, employment and single- family construction in these areas," said NAHB Senior Economist Michael Neal. "But with nationwide economic growth and favorable demographics, we can expect continued strengthening of the housing market across the country." The inventory of new home sales for sale was 301,000 in March, which is a 5.2-month supply at the current sales pace. The median sales price of new houses sold was $337,200 Great Lakes Limestone Trade Down 23 Percent The coldest April since 1997 put a chill on the Great Lakes limestone trade. Shipments totaled just 1,254,226 net tons, a decrease of 23 percent compared to a year ago, according to the Lake Carriers' Association. Loadings trailed the month's five-year average by even more – 33.3 percent. Loadings at U.S. ports totaled 1.1 million tons, a decrease of 19 percent. Shipments from Canadian quarries totaled 177,000 tons, a decrease of nearly 41 percent. Year-to-date the limestone trade stands at 1.5 million tons, a decrease of 12.8 percent. Shipments from U.S. ports total 1.3 million tons, a decrease of 7 percent. The year-to-date total for U.S. ports includes 17,664 tons loaded in February and 218,452 tons shipped in March. No limestone moved from Canadian quarries during the first quarter, so the April total is also the year-to-date total for Canadian ports. Since 1880, Lake Carriers' Association has represented the U.S.-flag Great Lakes fleet, which today can annually move more than 90 million tons of cargos that are the foundation of American manufacturing, power generation and construction: iron ore, limestone, coal, cement, and other dry bulk materials such as grain and sand. In turn, these cargos generate and sustain more than 103,000 jobs in the eight Great Lakes states and have an annual economic impact of more than $20 billion.